That’s A Cracker. When it comes to Xmas STock at Marthill Come & Fill Your Stockings to Earn Cash. That’s A Cracker. When it comes to Xmas STock at Marthill Come & Fill Your Stockings to Earn Cash. Biggest Choice in the UK. Christmas Stock Now Available! 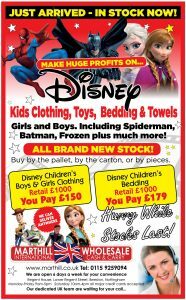 Branded Toys, Xmas Trees, Disney Clothing, Ideal for NOW and New Year Sales. Marthill is open for business 6 days a week including Saturdays on Demand. Earn Extra Cash For Xmas Stock Just Arrived Ideal for Anyone Looking To Make Extra Money. 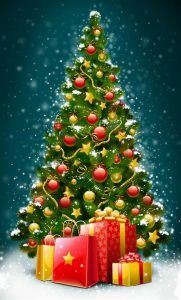 Christmas Trees and Christmas Gifts and Toys and Disney Clothing from one of the UKs Largest Cash & Carry Wholesalers Serving Car-booters , Market Traders, Online Sellers , Retailers, re-sellers, Facebook Sellers Don’t Miss Out. Open 6 days a week on Demand. Website 24hours. Team Marthill wish you a success and will help you earn extra cash with cheap prices and plenty of stock. BIKES / XMAS TREES / NEW CLEARANCE TOYS AND KIDS DISNEY CLOTHING! Don’t miss out once their gone their gone GET YOURS NOW. Earn Extra Cash For Xmas Stock Just Arrived Ideal for Anyone Looking To Make Extra Money. Christmas Trees and Christmas Gifts and Toys and Disney Clothing from one of the UKs Largest Cash & Carry Wholesalers Serving Car-booters , Market Traders, Online Sellers , Retailers, re-sellers, Facebook Sellers Don’t Miss Out. Open 6 days a week on Demand. Website 24hours. Team Marthill wish you a success and will help you earn extra cash with cheap prices and plenty of stock. 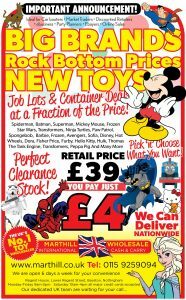 Review Marthill International Ltd Wholesalers Toys, Furniture, Disney Clothing, Household, Electrical. Xmas round the corner advising Traders to buy Toys and Xmas stocks NOW before stock has sold. Earn Extra Cash For Xmas Ideal Opportunity for anyone looking to buy toys, housewares, Disney Clothing, Nursery, Bedding, Electrical at a fraction of the RRP price to sell. 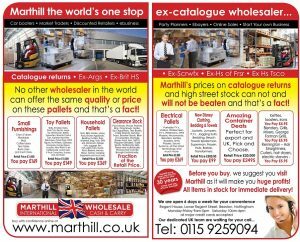 Marthill International Ltd Wholesale is a Returns Clearance Overstock Specialist Company based in Nottingham UK. We have an experienced team with over 40 years of trading who have the skills to buy and sell across a wide range of categories such as Toys & Nursery, Books, Stationery, Party & Greetings, Seasonal, Gifts, Homeware, Home Electrical, Hardware and DIY, Car Care and Sports & Leisure. Ideal stocks for all types of Retailers. Marthill International supplies Clearance Branded merchandise directly to wholesalers and retailers. Success in Clearance Branded Merchandise is more than just great names. You need innovative, well-designed and aggressively-priced merchandise that catches your customers’ eyes and represents fantastic values.